Are they in Heaven looking down? That question about the dead has been answered in the affirmative many times. It seems that I have heard expressions to that affect all my life (I am now 80 + years old), and monitoring of social media in the current age provides ample statements of belief that upon death the soul is transported directly to Heaven to be with the Lord. During the very early years I pretty much accepted the statements as fact. However, as I advanced in age and study of the Holy Bible, my acceptance of the statements as supported fact began to change. I considered and accepted the statements as the sincere belief and opinion of the speaker about the dead person’s goodness and justification for Heaven and the presence of the Lord. Some have said “what difference does it make,” and I cannot disagree with that attitude because it is something we cannot control or prove one way or another. In pursuit of Biblical support for the belief of immediate ascent I found some support, some support for the opposing belief, and some personal confusion. Immediate ascent is in conflict with my long-held understanding of death, the second coming of Jesus Christ, judgment, Heavenly rewards for righteous living, and punishment for the wicked. When I become aware of important, conflicting information it instills an urge in me to try to resolve the differing opinions or versions. In this effort, regarding the current question, I recently went to an authority to find an address of this subject, the website of Dallas Theological Seminary. My purpose in writing this article is not to prove my view, but to stimulate additional research and study by you, the reader, to form your own studied view. The source for the following verses related to what happens after death are from the Zondervan King James Version Study Bible. Note that spelling, sentence construction, and punctuation does not conform to current standards and may appear to be in error. 23 For I am in a strait betwixt two, having a desire to depart, and to be with Christ; which is far better: 24 Nevertheless to abide in the flesh is more needful for you. 1:23-24 Depart, and to be with Christ…abide in the flesh. Either alternative was a good one. While mysteries remain, this passage clearly teaches that when believers die they are with Christ, apart from the body. 1:23 far better. Being with Christ after death must involve some kind of conscious presence and fellowship (cf. 2 Cor 5:6,8). 1:24 more needful for you. Paul puts the needs of those he ministers to ahead of his personal preference. However, the most complete explanation of what happens to a believer the moment he or she dies is found in 2 Corinthians 5:6-8. (p. 85). 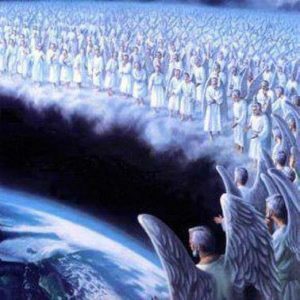 Until the new heaven and the new earth are completed, all Christians who die are immediately transported into the presence of God–the third heaven. The apostle Paul is clear that at the rapture all Christians will receive their new, glorified bodies in which they will live for eternity. “All Christians” includes those Christians who died prior to the rapture (“the dead in Christ,” as Paul calls them), as well as those Christians who are alive at the rapture and never experience death: (1 Thess. 4:16-18). (p. 87). Are They in Heaven Looking Down? On the basis of the above research, I say “no.” You decide on the basis of your own understanding of the Biblical references. I am certainly not qualified to override the opinions of the theological scholars. However, I believe the preponderance of the references do not support immediate ascent upon death. This is, I believe, supported by The Revelation to John (Book of Revelation) in the Holy Bible. I suggest a complete study of Revelation in order to digest the chain of events that are predicted in John’s dream of Revelation by God, to Jesus, to the Angel, to John, to the seven churches, to the messengers of the churches.